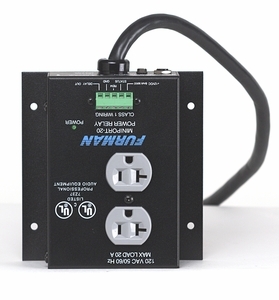 Power Relays are remotely controlled relays that switch 120 VAC. Control is via a full-size terminal strip that allows remote control via safe, inexpensive, low voltage Class 2 control wiring. Housed in rugged steel enclosure. Can be controlled from a remote location with either maintained or momentary contact switches. Due to 20 amp rating a special AC plug is required.